Dental control and dental position can be scary and associated with visible rails that must be fixed for at least 2 years. Fixed tooth position is difficult to take care of, to eat and to clean. In addition to the practical problems, the traditional toothbrush is not beautiful to look at. Now there has finally been a toothpick that eliminates all the problems associated with the traditional toothbrush. 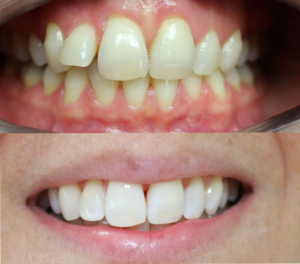 The new method is called Inman Aligner and makes it possible to get a new smile in just 6 -16 weeks. Inman Aliger is removable, discreet, the treatment is fast and the dentist uses only 16-20 hours per day. What is a Inman Aligner? Inman Aligner is a simple detachable toothbrush to correct tight and oblique front teeth quickly and safely. It works as well as independent treatment as initial treatment for continued cosmetic dental care with permanent denture or scalp therapy. Inman Aligner has nickel tan springs that through two opposing arches gently move their teeth to their new positions through collaborative pressure and tensile forces. The weak forces are active all the time as the teeth move. That's why Inman Aligner is so fast. The image below shows the "clamping effect" of the two arches across the front. How long is the treatment time with Inman Aligner? Most cases can be terminated within 6-18 weeks. Your Inman Alignand Dentist can give you a realistic schedule. For appropriate cases, Inman Aligner is usually a faster method than other alternative dental treatment treatments. What does a treatment with Inman Aligner mean? Imprint for the production of your custom Inman Aligner. Regular checks at dentists every other to every 3 week. As with all other dental controls, the end result must be kept in place-retinated. This is done with a so-called retainer, either in the form of a retaining thread glued to the inside of the teeth or with a detachable transparent rail. 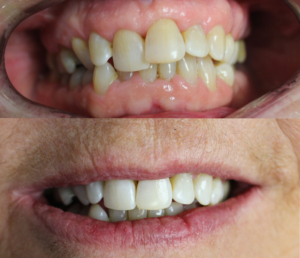 Here is the picture of our patient we treated with Inman Aligner for 10 weeks. Below you will see pictures of another of our patient treatments with Inman Aligner for 5 weeks. - Full investigation costs 3000 kr. 2 visit. All x-ray, photography and gypsum models are included. - The total cost of tandem regulation with Inman Alinger is SEK 17000-20000 depending on the size of the problem. The total cost includes investigation, treatment, 1's follow-up and dental bleaching at the clinic. - Fixed dental regulation can cost from SEK 5000-45000, due to errors and the time it takes to solve the problem. It should not hurt to have a tooth posture, but it may usually feel sore and uncomfortable during the first week after the denture has been inserted or a few days after adjusting the tooth posture. You may also have a sore throat on the tongue and on the inside of the cheeks or lips right at the beginning of treatment. This can be relieved by putting wax on the toothbrush. Of course, you should not change your toothbrush. If something goes off, if the wax does not help or if you're wondering something, you'll need to consult your dentist. It is also important that you check the regular checks, otherwise you may be wrong and that the treatment will take longer. When you undergo this type of treatment, you need to brush your teeth very carefully. Food residues and coatings accumulate very easily around the arches and brackets. The dentist can handle normal chewing, but you may still have to change your "eating habits" slightly. You should avoid eating things that are sticky and sticky, such as carbon, so you do not risk the thin steel arches bend. You must also try not to bite into hard things, such as apples and carrots, which could otherwise cause the fastened brackets to loosen. In order for it to be a good result, it is important to remember that you and we together are conducting a treatment. We stand for adjustment, adjustment, counseling and other measures - you take care of daily care. Should something not be in your mouth or if you have any questions please do not hesitate to contact the clinic immediately.